Mall theft, shoplifters in the Philippines mall has been a long time problem. They always come up with a different techniques once their operation got exposed. The syndicate operates in groups to cover up the designated thief. They are all over the mall looking for the possible victim, and once given a chance, just by eye contact and body language, they will all move in just a matter of seconds. And get away with the victim as quick as possible like any other normal shoppers while passing the loot to another member in case somebody is after them. 1st photo: the syndicate, keeping an eye to the chosen victim, watching for the right time, which is when the store crew turned her back to get the order ready. 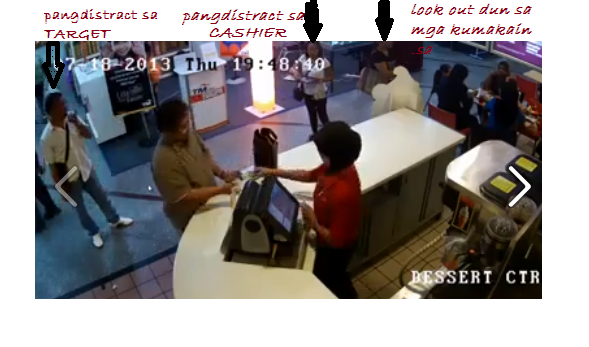 2nd photo: The man in black shirt, probably the leader of the gang, pointing the woman where to stand as a look out and at the same time serves as a shield to the costumers from the next store. 3rd photo: Shows the five members doing the assigned job. The woman with tray serves as a distraction to both the store crew and the victim while the designated thief is doing his job. Thieves are are always on the look out for your hard-earned cash, gadgets and credit cards. It is not wise to bring your valuables in a small bag wherever you go. Hold your bag always, put it on your lap and not behind you. Do not leave it on another chair or on top of the counter while paying. Most important of all is to keep an eye on it at all times. Thieves will do anything to get your attention. So always be alert and aware of the people in the surroundings. Parang 6 lahat, Maam Tess, including the man in black sa likod. It's really sad to know that there are people who are willing to do bad things to other people for their own sake. :/ Nakakatakot. Kaya we have to be alert all the time. Grabe na atalaga ang ibang tao ngayon, nagpapakasarap sa pinaghirapan ng ibang tao. The best that we can do is be vigilant. Dapat sa atin bawas-bawasan na ang pangialam ng Human Rights - ibalik na ang bitay at isama sa heinous crime ang illegal acts of syndicates kahit ganyan kagaan - kawawa yung victim at talagang walang takot ang mga magnanakaw na yan. Bilisan din ang paghatol at pagbitay para may takot ang mga halang ang kaluluwa. sa panahon ngayon hindi pwede ang malamya na batas at sistema. Looks like another organized sila and alam kung sino yung biktima. This is so alarming, just like what happen in Jewelry heist in Megamall. So we must be vigilant whenever we visit crowded malls. Wow, grabe. I just hope they will be caught any time soon. Such a shame.! Laman na ng mga Malls ang mga UGAG na yan. Best we can we can do is dapat mapagmasid tayo at huwag maging kampante sa galaw natin. It's a pity that there are people like who take advantage of other people and give malls and the Philippines a bad name. I've seen my friend share about this, taught me a lesson to be more careful with my Ipad as the bad elements are so fast now in stealing, so sad. Grabe ! Maging alerto sa mga taong paligid habang ingatan ang mga gamit nating dala ! Sana lahat ng Malls may CCTV sa lahat ng corners ! Sana nahuhuli lahat bago sila makalabas sa exits! This is a very helpful and informative article. We must really be alert and vigilant. 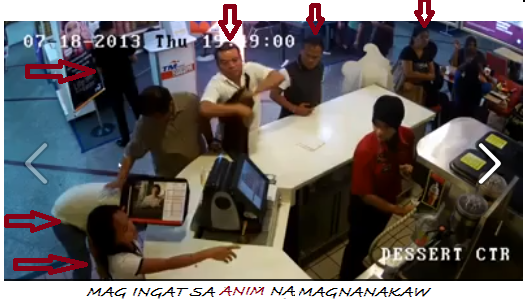 Buti na lang caught on cam, at least it will keep the public informed. I shared this post as soon as possible to warn people. Makes me GRRR, kapal ng mga face ng mga taong yan! I hope they will be apprehended soon! 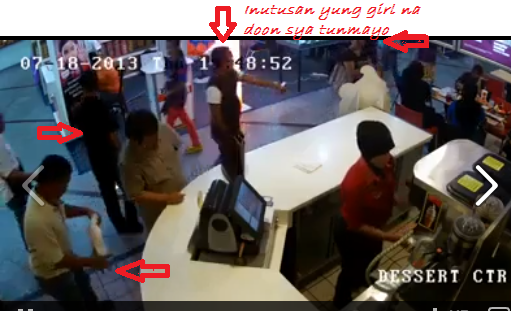 This happened to my friend when we were in SM Pampanga. Same method. We were able to know how they did it when the management allowed us to watch the cctv footage. Dapat po tayong mag ingat. Di natin alam kung sino na pala yung kaharap natin yun na pala yung mandurugas o snatcher. Nakakalungkot meron nito sa Pampanga.